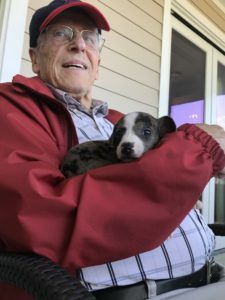 ST. LOUIS, MO — Through anecdotes and research, it’s well-known that pets can help people of all ages reduce stress, loneliness, depression, lower blood pressure and more. However, as a person ages, they often can no longer sufficiently care for a pet on a daily basis. 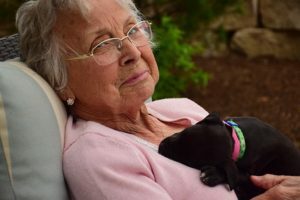 As part of its “Vibrant Life” program, Stonecrest at Clayton View has recently teamed with the Animal Protective Association of Missouri (APA) to find a way that animals, specifically puppies and kittens, can be a part of the extended family at Stonecrest and enrich the lives of their residents. This past February, Uber partnered with the APA and brought a few puppies for 15 minutes of cuddles to Stonecrest at Clayton View, the newly opened residential care community located in Richmond Heights, through its #UberPuppies project. This sparked an idea with the staff at Stonecrest, as some of their employees had occasionally brought their own dogs in for a day here and there, but nothing on a regular basis. “The APA has a program called PetReach,” Sarah Javier, president and executive director, APA said. “It’s a program where volunteers bring pets for short visits to residents of senior living communities. When we spoke with Stonecrest, they wanted to expand the program beyond short visits. We worked with Stonecrest to develop a program that allows their community to foster puppies or kittens for a few weeks at a time. The project just came together at the end of April and we are thrilled with the results.” The APA foster care partnership is a win-win for Stonecrest and the APA. Fostering helps the APA reduce exposure to illness during the early weeks of an animal’s life and provides critical socialization for the animals making them well-adjusted and eager to interact with all those they meet. These things make for a wonderfully adoptable pet that is happy and healthy. The puppies and kittens remain at the Stonecrest at Clayton View three to five weeks until they are old enough to be spayed/neutered and then adopted into their forever home (they must be at least 8 weeks old before they can be adopted). While at Stonecrest, the APA provides all needed supplies, including food, pet enclosures, medical care and vaccinations. Stonecrest residents and staff members are responsible for basic care, but most importantly, lots of love and belly rubs. Expanding the partnership with Stonecrest helps the APA meet the demand for animal foster families. The residents at Stonecrest also benefit from the foster program. 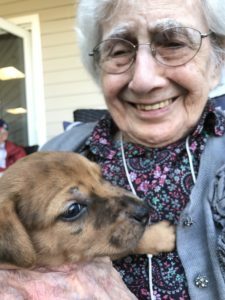 Seniors who participate with pets are more active as they walk with the puppies and engage with them, or simply pick them up – reaching and stretching more often. Having puppies available for cuddling also brings residents out of their rooms and encourages interaction with animals and those around them. And finally, having a puppy or kitten that depends on the residents gives them a sense of purpose and a reason for getting up in the morning. As a result, depression is lessened and the outlook on life is more positive and hopeful. It’s a special kind of medicine and care that only a tiny animal can provide. Stonecrest at Clayton View, located at 8825 Eager Road in Richmond Heights, Mo., opened on October 31, 2016. The community consists of 55 private, assisted-living apartments. In addition, there are 26 suites within a specially designed memory-care neighborhood. The cornerstone of senior living at Stonecrest is its resident-centered care and its signature “Vibrant Life” program. Working with each resident, the staff at Stonecrest creates an individualized care plan tailored to the resident’s needs, personal preferences and flexibility – balancing the support needed with the independence desired. Stonecrest Senior Living is a partnership between NorthPoint Development and Integral Senior Living. Currently Stonecrest operates communities in Kansas City, Mo. and Richmond Heights, Mo. During 2017, Stonecrest will open additional communities in Town & Country, Mo. ; Columbus, Ohio. ; Troy Mich.; Rochester Hills, Mich.; and Indianapolis, Ind. At its Clayton View location, Stonecrest residents can dote on adorable foster dogs from the APA Adoption Center. The program benefits both animals and humans. Tasha and Tessa, two five-and-a-half-week pitbull mixes, were left on an abandoned property in southern Missouri. The APA Adoption Center took them in, and now they’re getting showered with love—by the seniors at Stonecrest’s Clayton location. Bernie Landau visits the pups daily with his wife, between sessions of model ship-building. “They do much to enhance my morale,” he says. “And I visit them every chance I get,” adds Darlene Murray, who gets called the “dog whisperer” because she’s so good at lulling the animals to sleep. Besides taking pressure off shelters—which can’t always accommodate every pet—the program benefits both dogs and humans. For Landau, it reminds him of younger days. “I grew up with pets—interacting with them, them putting up with me,” he says. According to studies, there are lots of mental health benefits to interacting with dogs. And, Javier adds, some scientists think that playing with dogs can improve arthritis (by providing a reason to move hands) and lower blood pressure. The dogs get something out of it, too. As abandoned animals, they might not have the best experiences with people. And the less socialized a young animal is, the harder it can be to adopt the pet. But with dozens of people doting on them, a few weeks at Stonecrest have made APA’s abandoned puppies happy and well-behaved. “Our hope would be to get puppies and kitties into every senior facility,” says Javier. Kids learn the ways dogs and cats communicate, the proper way to approach a dog and what to do if approached by a stray animal. Ages 4+. Attendees will learn about things to consider when adopting a cat, how to care for a cat once they are home, how to best interact with a cat and interpreting a cat’s body language. This class is open to children and adults of all ages. There is no cost to attend, however, donations to support our animals are always welcome. Classes are held at the APA (1705 S. Hanley Road, St. Louis, MO 63144). To reserve a space for any of these classes, please email assistant@apamo.org or call 314-645-4610.